• The Curriculum for the Program covers the essential requirements to build an individual to be a productive member of the Community. That they can contribute to making the Community to be more unified, inspire growth, and these individuals who have been trained by the Trainers can in turn mentor other members of the Community to follow their lead. • The goal of the Program is to Renew and Rebuild individuals who have fallen victim to the tyranny of the Social Abuses that are ravaging the Community. • Violence, Drug and Alcohol Abuse, Sexual Abuse, to name a few of the Abuses, appears to have been the cause of Depression, Fear, and as such affected Economic growth and Education and Health adversely. • Building This Team of Trainers to distribute the Life Styles and the Leadership Curriculum will unleash a force to challenge the Social Problems that are predominant in the Community. 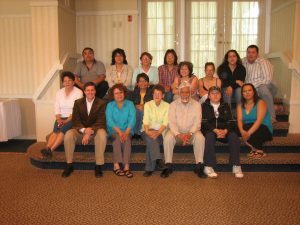 • This Team of Trainers Mission is to fill the Void of the emotional support system in the Community. They will be like yeast in the dough to make wholesome bread. They will challenge the adversities that have been the cause of the Social problems. • This Team will be coaching, inspiring, and training on a continuous basis to combat the Social and thereby the Health issues that are ravaging the community now. The Children of the Community are already becoming victims of it or are becoming vulnerable to it. • The Team of Trainers is from the Community and knows the heartbeat and can feel the pulse of their own people, which no other Trainers can feel. Moreover the Trainers will be available most of the time to have ongoing continuous Training. 21 Trainers from the Cree Territory of James Bay, Northern Quebec, went through the Nishiiyuu Train the Trainer 26 day program conducted and designed by Tulshi Sen Consulting which transformed their lives. At the completion of a successful 2 day Retreat for Social Workers and Childcare Workers with Tulshi Sen, based on his book, "Ancient Secrets of Success" and Pre-Contact Culture. 1) This Project will build Capacity. The Trainers will be from the Community and the Training will be done in-house. This way the training will have continuity. It will decrease the need, if not eliminate, in engaging outside Trainers. As a result it will increase employment opportunities in the Community. 2) In-House Trainers who are already an integral part of the Community can better understand their clients (Trainees) than outside trainers can. The In-House Trainers can empathize more effectively with their clients which the outside Trainers cannot. They will know what will and what will not work as they themselves have had first hand experience in facing the problems and issues. They can establish rapport and Trust, better than any outside Trainers would be able to. These five elements are an integral part and indispensable to any Leadership and Life Styles Program. 5) They could monitor the development of their clients and effectiveness of their Training and take corrective measures if necessary which the outside Trainers will be at a disadvantage. b) They can train their clients from an empowering premise that their clients have what it takes to overcome their problems and issues. This is an empathetic process which the outside Trainers would not be as effective in. The Trainers can relate to their clients more than any one else as they may have experienced the same feelings. c) Most people go through life realizing only a part of their potential and sensing that there is so much more that they are capable. The In-House Trainers should be able to offer a means for unleashing this latent potential. d) The In-House Trainers then can effectively follow up and keep their clients on track and get commitment for their development. e) Improve results of their clients and their own team. 9) The Train the Trainer Project will have an all pervasive effect in the Social, Economic, and Education and Health of the Community. It is not only a repair or reconstruction project it is building a New Vision for the Community and the Trainers are the fuel that will drive the community to this New Vision. People build community and people must be built to build the Community.